Conditions have been perfect recently for windsurf courses at Hurawalhi. Light-medium winds combined with clear skies over the lagoon have created a great spot for guests to take advantage of the range of courses offered by Ocean Watersport. Hurawalhi guests Katalin, Jennifer and Patrick, enjoying a family holiday together, joined us for a windsurf group introduction, where they experienced their first steps of windsurfing in our lagoon area. The group introduction is available for all guests at Hurawalhi as part of their package; this allows you to get first-hand experience of windsurfing under the guidance of Ocean Watersport’s instructor team. This is a great opportunity to not only have a lot of fun, but also try the sport and see if it’s a good match for you. 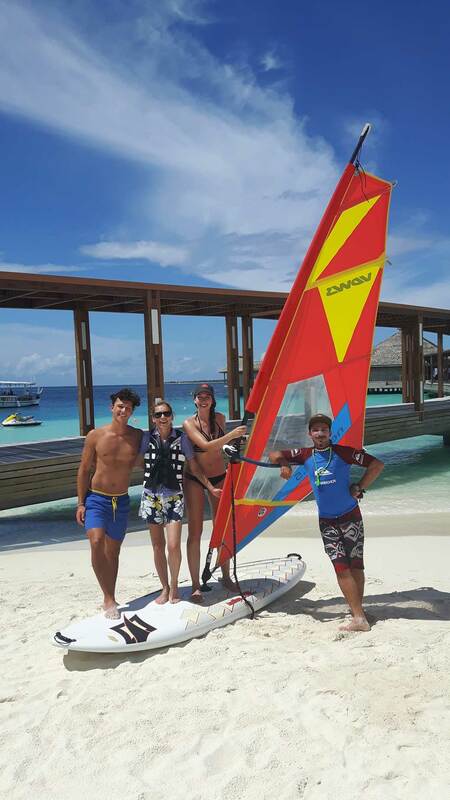 After the introduction, all three had caught the windsurfing bug and immediately booked their windsurfing course with us. Our instructor Antonio lead the course, teaching them the basics, with the most important goal being able to turn and windsurf back to where you started from (without falling off!). In a total of 3 hours all of them managed this really well and below pictures definitely show that they had a great time together. Basic Course (8 hours): Covers basic skills, plus more detailed theory and some advanced manoeuvres, with the aim to take the International VDWS Llicense, which proves that the student is able to windsurf safely on his own (a requirement from many watersport centers worldwide in order to rent windsurf equipment). Ocean Watersport also offer private lessons, ideal for guests who either already have some experience and would like to take the next step to improve their skills or those who prefer doing a refreshment before heading out on their own. We hopefully see you soon at Hurawalhi for some windsurfing action together!